The bloodthirsty dragon Tharn assimilates all he consumes into his ghastly army. Unfortunately for all who live, his appetite has proven insatiable. 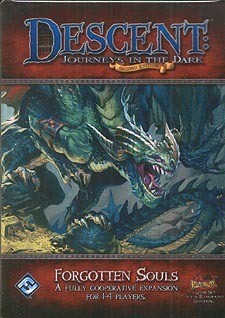 Discover new ways to play Descent: Journeys in the Dark Second Edition with Forgotten Souls. This expansion removes the overlord player and allows 1-4 hero players to enjoy a fully cooperative adventure experience! The heroes must explore a constantly expanding map while overcoming dangerous perils and completing diverse rooms, all before the forces of doom and fate bring about their untimely demise!